The Philharmonic Society ‘Mantzaros’ (P.S.M.) was founded in 1890. The music band made its first official performance, at the litany of Saint Spyridon, on the first Sunday of November, in 1890. In 1896, the P.S.M. took part in the events of the Olympic Games in Athens. In 1950, it established a School for Phonetics. In 1952, it established a Symphonic Orchestra. In 1954, it included in the musical band, the first female musician. In 1974, it created a school band (bandina). In 1982, it established the part of the Cheerleaders. In the same year, the Music Band made some very impressive performances, at a Feast in Bulgaria, as well as at the closing ceremony of the European Games, at the Panathenaic Stadium. In 1985, the music band, with the part of the Cheerleaders, made some incredible performances on the island of Rhodes and in Bulgaria. In 1986, the band took part in the opening ceremony of the European Volleyball Games, in Athens. In 1987, the band was awarded by the Academy of Athens. In 1990, in order to celebrate the first 100 years of the Society, it took place a magnificent performance of the Music Band, the Bandina and the part of the Cheerleaders, in the music hall ‘Palace’ of Athens. In 1991, the Philharmonic Society ‘Mantzaros’, with the Music Band and the part of the Cheerleaders, participated in the opening ceremony of the 8th World Youth Championship of Handball, at the Peace & Friendship Stadium. In 1993, the Music Band of the P.S.M. made a magnificent performance, in the music hall ‘Palace’ of Athens, for the celebrating events for the year of ‘Kapodistria’. In 1996, the P.M.S participated in an Austrian event with international participation, the 17th European Festival of the Philharmonic Bands of Vienna. The participation took place, after the invitation of the Culture part of the Municipality of Vienna and with the collaboration of the Federation of Austrian Brass. 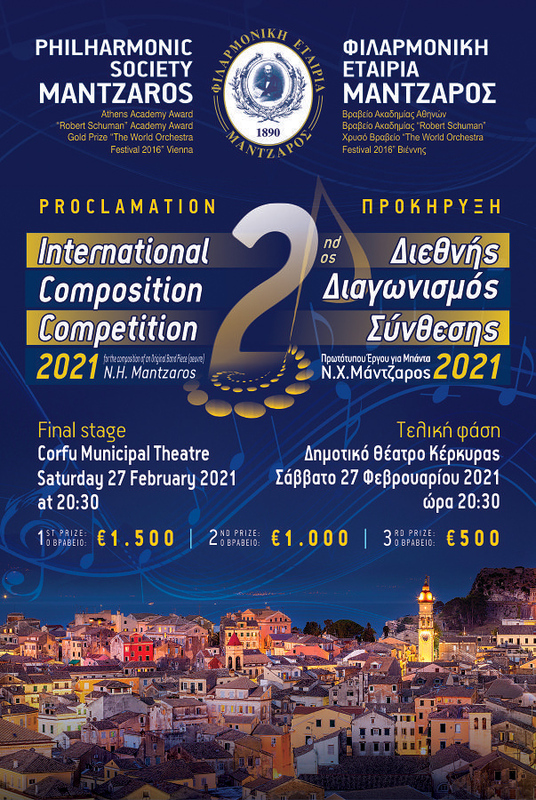 The Philharmonic Society ‘Mantzaros’ represented deservedly the Music tradition of the Island of Corfu and generally the Greek music, in the capital of the world music. In 2000, the Bandina of the P.S.M. participated in an artistic event and in many concerts, with the band BAD SAROW of Hannover, in Hannover in Germany, where the band was invited. In 2003, the PSM performed a concert in the Greek National Opera. In 2007, it participated in the military parade, in Thessaloniki. In 2009, the PS ‘Mantzaros’, with the participation of the Choir of Corfu, performed a celebrating concert, which included the pieces of work of Ionian composers, for the establishment of some stanzas of the Hymn to Liberty, as the Greek National Anthem, in the Athens Concert Hall (Friends of Music” Hall). In 2011, the Philharmonic Society ‘Mantzaros’ performed a celebrating concert, in the Thessaloniki Concert Hall. The reasons of this celebration were the following: the welcoming of the relic (hand) of Saint Spyridon, in Thessaloniki, the 90 years from the establishment of the refugee district ‘Triandria’ and the establishment of the temple of Saint Spyridon in Triandria. In 2013, the band participated in a Philharmonic Festival, in Bulgaria. It’s worth to mention, that every year, the music band performs at least four official Concerts in Corfu and takes part in all the scheduled religious and national events. Today, the Music Band consists of 300 musicians.